"With the disappearance of the Etruria Grove and, later, the final decay of all vegetation in Etruria, it was decided to open a park there! On Thursday, September 29th, 1904, the opening ceremony was performed and the Etruscans at last had their own park, although a dozen years had elapsed since the Corporation of Hanley had purchased the land - eleven acres - at a cost of four thousand seven hundred and nineteen pounds, seventeen shillings and sevenpence. Mr. Robert Thompson, F.R.H.S., Parks Superintendent, put much good work into the park, covering it with springy turf, young trees and shrubs. To the several thousands attending the opening ceremony in delightful weather, all was new and beautiful. Alderman Shirley presented the Mayor with a silver-gilt key, with which he opened the gates, while the Mayoress turned on the fountain and drank to the success of the new Park." The 11-acre park was built next to St. Matthews church on a triangle of land between Lord Street, Etruria Vale Road and the Trent and Mersey Canal. Lord Street (Now Etruria Road) is a main road from Burslem and Hanley to Newcastle under Lyme. A number of streets of terraced houses laid out below the parks are named after South African towns prominent in the South African Wars (1899-1902), also known as the Boer Wars, a conflict in southern Africa between the British Empire and the allied, Afrikaner-populated Transvaal (or South African Republic) and Orange Free State (modern Free State), in what is now South Africa. 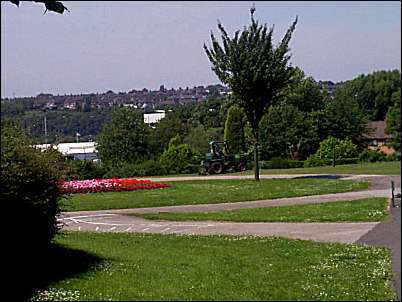 Etruria Park was laid out in Etruria Valley at the start of the 20th century opposite Josiah Wedgwood's Etruria pottery works and Earl Granville Shelton iron works. Now neither the pottery or iron works remain and a walk through the small park reveals well laid out flower beds with tennis sand basketball courts a playground and two bowling greens. 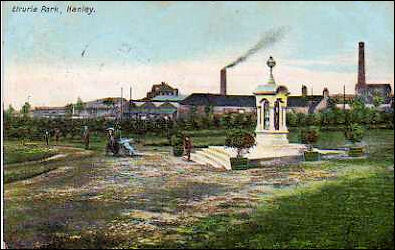 In the park is a fountain (1904) presented by the Shirley brothers of Etruria bone and flint mill and a plaque erected in 1953 to commemorate Henry Wedgwood's photographic achievements. Etruria Vale Road / Dundee Road entrance. In the middle background is the white building of the Sentinel Newspaper, this was the site of Josiah Wedgwood's Etruria factory. Shelton Iron and Steel Works was also in this area.